Big changes here at Château Rauzan-Ségla over the last twenty years. Despite is excellent location and terroir this was a second growth Margaux that languished for many years. It was bought in 1994 by the Werthheimer family who own Chanel and lots of investments have been made. John Kolasa, who used to be at Château Latour in the early 1990s, was in charge for almost two decades until his retirement in 2015. Today Rauzan-Ségla produces big, bold, strong wines which also manage to provide Margaux perfume. 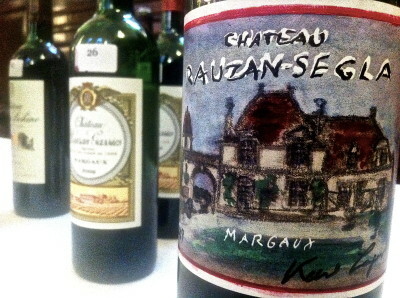 Often, alongside Château Palmer, it is the finest wine in the Margaux appellation besides that of Château Margaux itself. 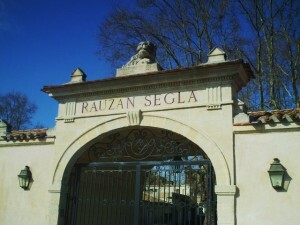 Ségla is the second wine. Consulting oenologists are Jacques and Eric Boissenot. Vineyard/Soil: 52 hectares on deep fine gravel with clay at different layers planted to 6600-10000 vines per hectare. Plantings comprise 54% Cabernet Sauvignon, 41% Merlot, 4% Petit Verdot and 1% Cabernet Franc. Green harvest and leaf thinning. Grapes entirely hand-picked into twenty kilo boxes and then sorted on a vibrating table at the cellar. Grapes are de-stemmed without crushing. Winemaking/Elévage: 35 stainless steel and temperature controlled vats# with capacities between 41-220hl which provide for single plot fermentation. 6-8 day alcoholic fermentation with pumping over is followed typically by a maceration of 12-20 days depending on the vintage. The wine is aged in approximately 50-60% new oak, medium toast from a variety of coopers, in French oak. During barrel maturation, the barriques are topped twice weekly, and then racked every three months. Egg white fining, no filtration. 10,000 cases of the Grand Vin produced and 10,000 cases of the second wine Ségla are made. 2009 Deep and saturated looking; very intense on the nose; minerals, cassis, pretty pent up and not currently as flashy as some [or as it was during primeurs]; loads of fruit on the palate though; layer upon layer of blackcurrant fruit here – this has such a long way to go. Tannins pretty hefty but ripe. Needs some time and will be long-lived. Drink 2019-2040. 95+ MW Institute, Nov ’13 [Earlier note] Inky and deep looking; perfume, lots of flavour on the nose; oak influence too; violets on the palate with black fruits; density and depth; overall a serious effort and looks to be very good though a trifle shut down from its showy primeur self. A great wine in the making though. Shame about the dreadful Karl Largerfelt designed label that’s all. 93-95+/100 UGC Oct ’11 [Earlier]Deep and intense; up to rim; sturdy creamy note; summer fruit compote; intense nose; some violets; good palate; structured oak but good flesh here. This is really good. 92-94+. Some coffee and intensity on the finish. [Second] Very deep and dark; perfumed and intense violets; cherry, some eau de vie; plums and very ripe fruits. Palate sweet entry and big and tannic but ripe tannins and not at all drying; Big wine and lashings of fruit with nice chew and bite at the end. Very powerful style of wine which works in this case. Terrific. 95+/100 [13.9% alcohol, 58% Cabernet Sauvignon, 42% Merlot] Tasted 30th March and 1st April 2010.